Effectively controls many types of green or green water algae, string or hair algae and blanket weed in ponds that contain live plants. Controls existing algae and helps resolve additional algae blooms. Keeps ornamental ponds and water gardens clean & clear. Can be used in ponds with plants! 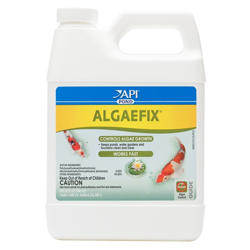 This product works very well and doesn't harm your aquatic plants or fish when used according to label instructions. Add one dose every three days until algae is under control (usually 3-4 doses) and then once per week to prevent the return of algae.